In 2014, Branding By Air completed the R&D phase of our video banners. 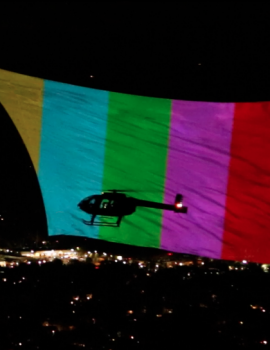 In a world-first, we’ve combined current projection mapping technology with our aerial advertising expertise. Our recent VMAs 2016 campaign with MTV used this with great success and earned us the Guinness World Record for Largest Aerial Projection Screen ever created. If you’re looking for a new canvas on which to create a global impact, look no further. We are the only company in the world who can now project video onto one of our jaw dropping banners, creating giant TV quality moving pictures at night. And you thought fireworks were exciting; wait until you’ve seen your brand illuminating the night sky! Take a look at the 250 foot wide flying video screen and the technology behind it.